When the SS Kursk sank in Belgian waters in 1912 it carried a highly valuable shipment of precious French crystal. In this book, translated from the original Dutch into English for forthcoming publication by Caithness-based Whittles Publishing, through text and photography this extract gives insight into the ill-fated ship’s unique luxury cargo which was in-part bound for Russia’s Tsar Nicholas. Some North Sea shipwrecks hide valuable cargo that is discovered many years after the ship has been lost. 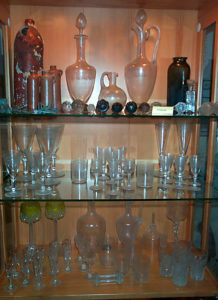 For example, the SS Kursk contained a precious shipment of French Baccarat crystal. Worth a fortune in 1912, it was a luxury product only the richest could afford. During the night of 26th August 1912, a heavy storm, tracking south-west, was raging in the North Sea, putting a lot of ships in distress. One of these was the SS Kursk, on its way to St Petersburg, Russia. When berthed in Antwerp, an 8m granite column with a bronze eagle was placed in the hold of the 80m long ship – intended to be erected at Borodino, Russia, to commemorate the battle fought there against Napoleon in 1812. 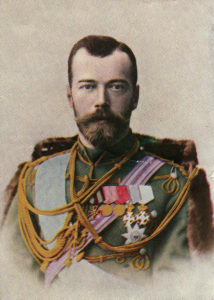 The French sculptor Paul Besanval designed the monument and would be personally supervising its placement in Russia. When the loading of the Kursk was completed, Captain Wiencke and the Belgian pilot wanted to leave quickly as the weather was becoming worse by the hour. 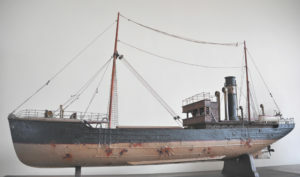 The ship was built in 1881 at the Copenhagen shipyard of Burmeister & Wain, and was fitted with a 150hp steam engine. This was fired up by the stoker on the afternoon of 26th August 1912, and the SS Kursk commenced its long journey to Russia. When the ship was steaming down the Scheldt river the weather deteriorated, and once at sea a full-blown south-westerly storm developed, placing the Kursk in serious peril. What happened next is anyone’s guess. One of the theories is that the ship took a north-westerly course, and taking the waves broadside made the ship roll heavily. This rolling could have made the monument slide to one side, creating a sudden list and subsequent flooding. What is known is that none of the passengers or twenty-seven crew were able to launch the lifeboats in an attempt to save themselves. The next day several bodies washed ashore on the Zeeland coast, including Captain Wiencke’s wife and the Belgian pilot. 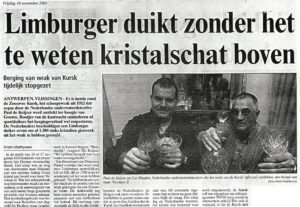 Some days later the newspaper noted that skipper H. Tanis of the fishing boat OD20 out of Ouddorp found a damaged white lifeboat carrying the name Kursk Kopenhaven offshore of Brouwershaven, close to Renesse, in the Netherlands. 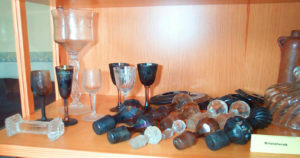 The wreck has been visited by divers for many years, although it was not until 1999 that a couple from Limburg found the first crystal in 1999 on the then unidentified ship. They kept their discovery a secret until a Dutch team led by Cor Wouben, who had nonetheless heard about the find, visited the wreck. This team found a small milk jug marked with the logo of the shipping company DFDS, the abbreviation of Det Forenede Dampskibsselskapet, Copenhagen. DFDS is still active and has a branch office in Belgium. 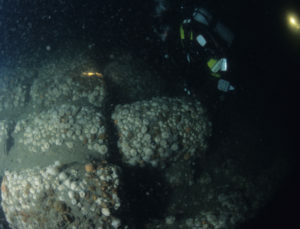 When the story about the monument became known, the Netherlands Association for Ship and Underwater Archaeology (NISA) issued a salvage ban to protect the monument from treasure hunters. 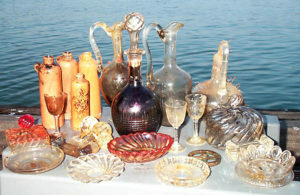 The salvage prohibition is still in force today and is enforced by the Dutch coastguard. The wreck is in the geographical position of 51.53.70 north/003.32.09 east. It is also marked on sea maps and is outside the shipping lanes. The top of the wreck is at a depth of 26m; however, if you drop down below the deck of the ship, a depth of 32m can be reached. 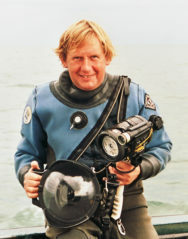 The visibility can vary from centimetres, requiring divers to use a reel to navigate, to 6m on a good day. 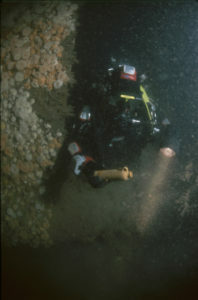 The forward part of the wreck, up to the engine room, is buried under sand and silt. The engine room is still recognisable, but you need to watch out for fishing nets and lines in this area. The rear cargo hold contained the load of crystal, which has mostly been recovered. Another part of the cargo consisting of barrels is still visible, and over the edge at the stern you will find the propeller sticking up from the sand. Diving For Treasure by Vic Verlinden and Stefan Panis is forthcoming from Whittles on 31 October priced £18.99.